The initiative is a first-of-its-kind loyalty programme that enables consulting engineers to bring safe, clean water to communities in need by learning about, selecting or specifying Xylem products and services. 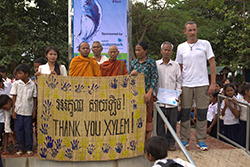 Global water technology company Xylem recently took 14 customers and staff from the UK, Germany and France to Cambodia on the inaugural volunteer trip of its Waterdrop initiative. For every drop, or loyalty point, Xylem donates $1 (USD) to build water towers for people who lack access to safe drinking water. Each drop also serves as an entry in a drawing to win the experience of a lifetime – a volunteer trip to construct and install these water towers at various locations around the world. The nine winners who joined the inaugural Waterdrop trip were: Caroline Oun, application engineer HVAC at Agotherm, France; Laurent Henneton, general manager at LH Conseil, France; Mevin Mootoosamy, general manager at M.C.H Building Engineering, France; David Everington, senior mechanical engineer at Cundall, UK; Kevin Sloyan, owner of Aish Electro-Mechanical Services, UK; Martyn Dunne, principal mechanical engineer at Hydrock, UK; Matthias Hinz, planning and project management at Wolff + Partner, Germany; Guido Kierdorf, managing director at Haustechnik Kierdorf, Germany; Karsten Krebs, managing director at Karsten Krebs Sanitär – Heizung – Kundendienst, Germany. The winners, along with five Xylem employees, embarked on the 15-hour trip to Siem Reap, Cambodia on 5 November. In the two days that followed, the volunteers built three water towers at the elementary schools of Roka Village and Chhouk Sar Village, in partnership with Planet Water Foundation, a USA-based, non-profit organisation. The towers are designed for quick construction, one-day installation and easy manual maintenance. They operate without power, last up to 10 years and use an ultra-filtration filter system to produce 10,000 litres of water each day – enough to provide 1,000 people with sustainable access to clean water both for drinking and hand-washing purposes. In total, 3,000 Cambodian youth, their families and communities now have access to clean water through the Waterdrop effort. The team also worked closely with nearly six hundred pupils of the two schools, educating them on the importance of proper hygiene and water use: according to Water.org, every year an estimated 842,000 people globally – approximately 2,300 people per day – die of diseases caused by inadequate sanitation and drinking water.